Crib Point Engineering have standard cranes that can be fitted to there range of Marine Straddle Carriers. These cranes are built tough to survive the harsh marine environment. 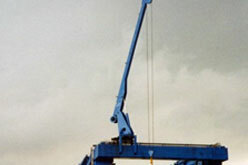 Cranes can be fitted with either electronic load cells or hydraulic load cells. Full Australian crane code compliance. Variable Hook, Jib and Slew speeds. Paint to suite a full marine environment. Stainless steel fasteners where applicable.